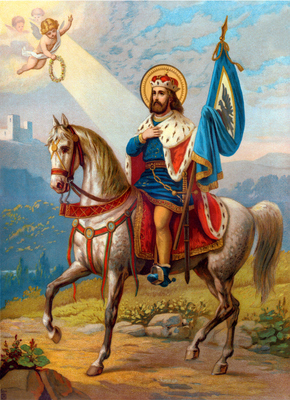 Saint Wenceslaus, also known as Vaclav, was born in 907, near Prague, the son of the king and queen of Bohemia. His father, Vratislav, was killed in battle when Wenceslaus was young. This left the kingdom in the hands of his pagan mother, Drahomira. Wenceslaus’ grandmother, Ludmila, educated him; her hope was that he would one day be a Christian ruler of his country. By the time Wenceslaus was ready to assume the throne, pagan nobles, prompted by Wenceslaus’ mother, killed Ludmila while she was at prayer. However, she had done her work well; at the age of fifteen, Wenceslaus became a Christian ruler in a country that was only partly Christian. When Wenceslaus took the throne, around 922 AD at the age of fifteen, he first made peace with his mother so that he could govern his country. He encouraged Christianity and ended the persecution of Christians. He brought back exiled priests and built churches. He ruled strictly but justly, and ruthlessly suppressed disorder and oppression by the nobles. People called him the “Good King” because he gave alms, was just to both the rich and the poor, visited prisoners, and improved the education of his people. King Wenceslaus finally fell victim to a conspiracy of his religious and political adversaries. Boleslaus the Cruel, Wenceslaus’ brother, was also jealous he was king. After Wenceslaus married and had a son, Boleslaus’ hopes for the throne were crushed. Taking advantage of the feelings of the vengeful nobles, Boleslaus hatched a plan. He invited Wenceslaus to a banquet to celebrate the Feast of Sts. Cosmas and Damian, at Boleslayvia, Bohemia. The next morning as Wenceslaus was on his way to Mass, Boleslaus attacked him on the steps of the church, and while they were struggling, a group of Boleslaus’ followers joined the fray and Wenceslaus was murdered. Before he died, Wenceslaus asked God’s mercy for his brother. The year was 929; Wenceslaus was 22 years old. Many miracles were attested to him in a very short time and the Roman Catholic Church soon proclaimed Wenceslaus to be truly a Saint of God. Why do we pray for the intercessions of Saints? It is likely that you have heard the term “stewardship.” In fact, St. Wenceslaus Parish has declared itself a “stewardship parish,” joining virtually every other parish within the Diocese of Bismarck. But, do we know what it means? What is a Steward? One definition states that a steward is a person who manages the affairs of the household or an estate for the owner. In the Christian sense, a steward is the manager of the affairs of God on earth. God has made each of us a steward and given us abilities and talents that are unique. We should use those abilities and talents to serve God. Everything we have is given to us by God: time, health, relationships, talents, property, the environment. A Christian steward serves God out of love and gratitude for these gifts, knowing that it’s not how much we have but what we do with what we have that is important.